82% of kids 6-17 say I know I should read more books for fun. 78% of parents say that reading is beneficial to their child's ability to develope vocabulary and language skills. 71% of parents say that reading nurtures their child's imagination. 68% of parents say that reading more makes their child more excited about the idea of reading in general. 64% of parents say that reading helps their child to be successful in school. 64% of parents say that reading encourages their child to spend time away from technology. 91% of kids ages 6-17 agree that it is very important for their future to be a good reader. 97% of parents with kids ages 6-17 agree that it is very important for their child to be a good reader for their future. 76% of kids ages 6-17 say that books they've read have inspired them to believe in themselves. 90% of kids ages 6-17 say that they feel proud and have a sense of accomplishment when they finish reading a book. In a survey, children were asked: "Which best describes you? : currently reading a book for fun, not currrently reading a book for fun, but just finished one, or haven't read a book for fun in a while". More than half of children answered that they were currently reading a book for fun, and one third said that they had just finished one. Younger kids are the most likely to currently be reading or have recently read a book for fun. 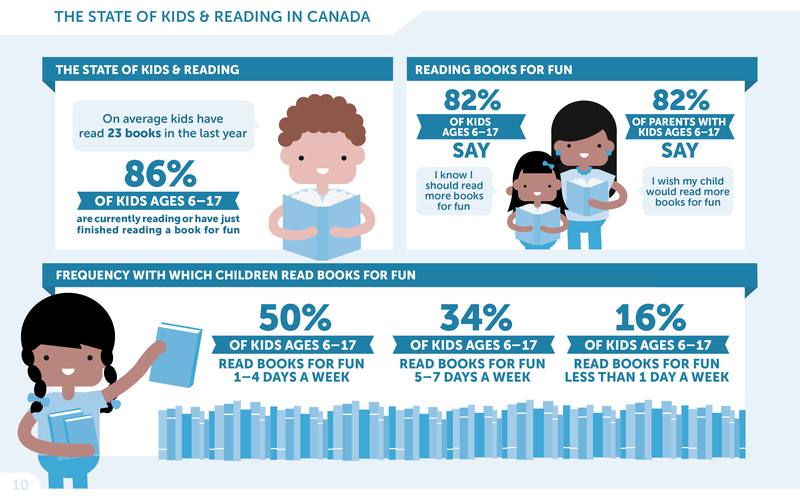 In total, 53% of kids said they were currently reading a book for fun, 33% said that they were not currently reading a book for fun, but just finished one, and 15% said that they haven't read a book for fun in awhile. 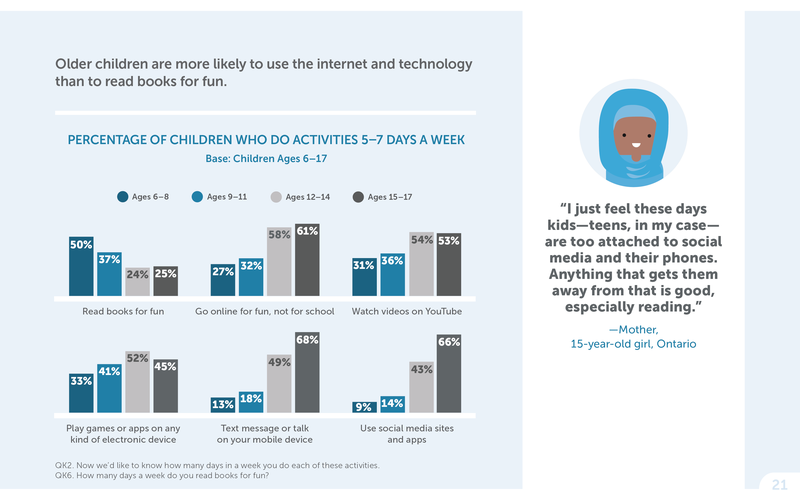 For kids of ages 6-8, 54% of kids said they were currently reading a book for fun, 39% said that they were not currently reading a book for fun, but just finished one, and 7% said that they haven't read a book for fun in awhile. 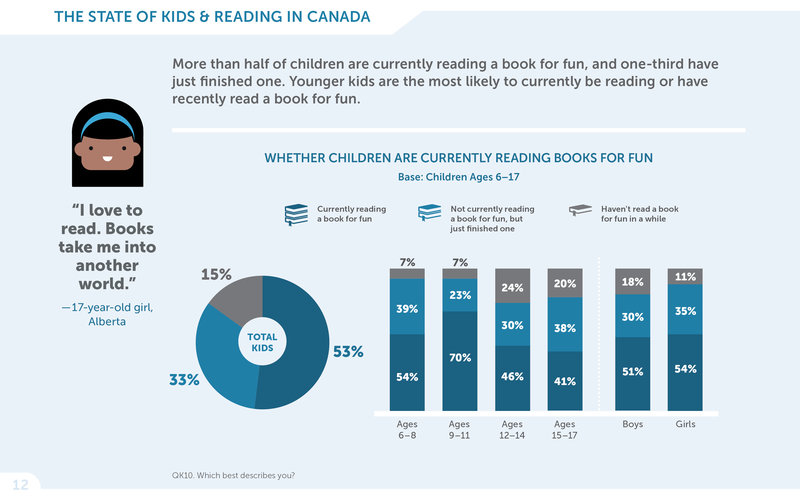 For kids of ages 9-11, 70% of kids said they were currently reading a book for fun, 23% said that they were not currently reading a book for fun, but just finished one, and 7% said that they haven't read a book for fun in awhile. For kids of ages 12-14, 46% of kids said they were currently reading a book for fun, 30% said that they were not currently reading a book for fun, but just finished one, and 20% said that they haven't read a book for fun in awhile. For kids of ages 15-17, 41% of kids said they were currently reading a book for fun, 38% said that they were not currently reading a book for fun, but just finished one, and 20% said that they haven't read a book for fun in awhile. 54% of boys asked said they were currently reading a book for fun, 30% said that they were not currently reading a book for fun, but just finished one, and 18% said that they haven't read a book for fun in awhile. 54% of girls asked said they were currently reading a book for fun, 35% said that they were not currently reading a book for fun, but just finished one, and 11% said that they haven't read a book for fun in awhile. 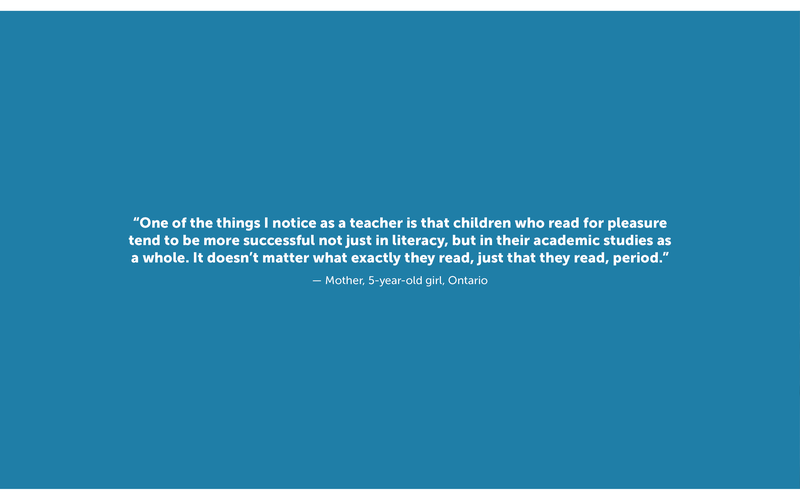 An open ended response from a 17 year old girl from Alberta about reading: "I love to read. Books take me into another world"
Girls are more likely than boys to be frequent readers, as are young children compared with older children. Children from age 6-17 were asked how many days a week they read (or looked at for ages 6-8) books for fun. In total, 34% of kids claimed to be frequent readers (reading 5-7 days a week for fun). 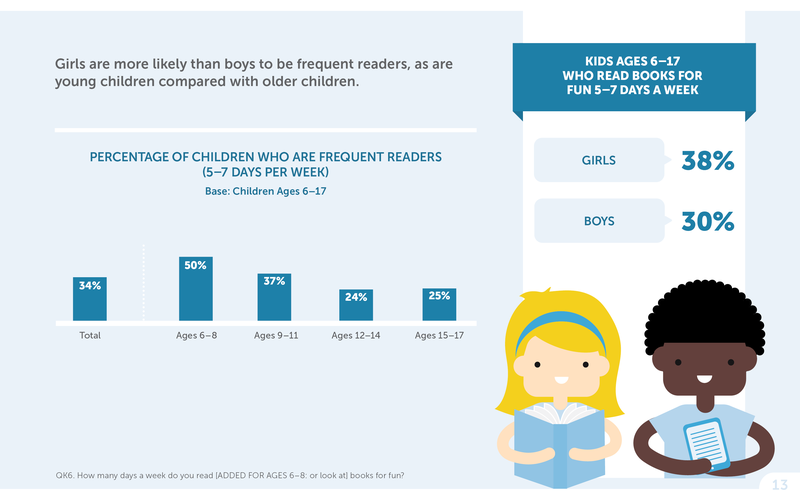 50% of kids ages 6-8 claimed to be frequent readers. 37% of kids ages 9-11 claimed to be frequent readers. 24% of kids ages 12-14 claimed to be frequent readers. 25% of kids ages 15-17 claimed to be frequent readers. Of all children ages 6-17, 38% of girls claim to be frequent readers, while 30% of boys claim to be frequent readers. Parents of kids aged 6-17 were asked how often they personally read print books (not including instances of reading to their children). 32% of parents said that they were frequent readers (reading for pleasure 5-7 days a week). 45% of parents said that they read 1-4 days a week. 24% of parents said that they read less than one day a week. It was found that kids who are frequent readers are more likely to have parents who read frequently aswell. An open ended response from a Mother of an 11 year old girl from Nova Scotia on why she enjoy reading books for fun: "I had a hard time learning to read as a child, but once I learned, it opened up a whole new world that I loved. I would love for her to have the same enjoyment that I had as a child." 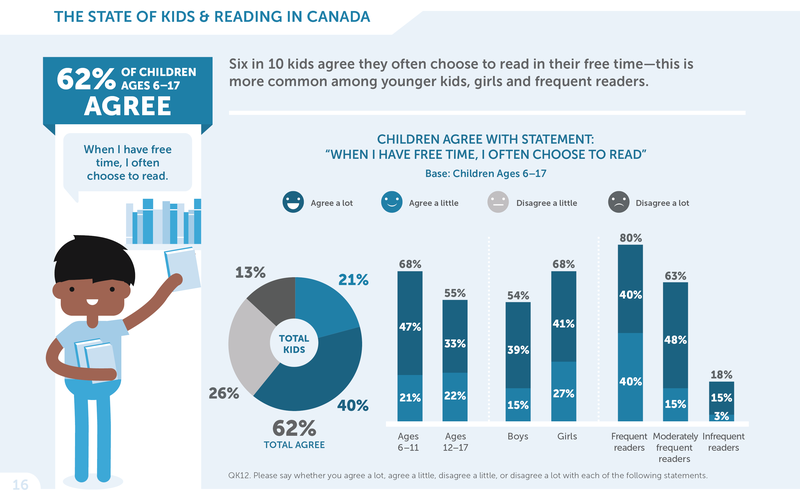 The State of Kids & Reading In Canada. Kids have read 23 books on average in the last year, with the average decreasing as children get older. Children from age 6-17 were asked to approximate how many books they had read in the last year. In total, 2% of kids asked said they had read no books in the past year, 46% said they had read 1-9, 27% said they had read 10-19, 13% said they had read 20-49, and 12% said they had read 50+. The average amount of books read per year for all children asked was 23. In regards to kids age 6-8, 2% said they had read no books in the past year, 29% said they had read 1-9, 29% said they had read 10-19, 16% said they had read 20-49, and 25% said they had read 50+. The average amount of books read per year for all children age 6-8 was 37. In regards to kids age 9-11, 1% said they had read no books in the past year, 39% said they had read 1-9, 31% said they had read 10-19, 18% said they had read 20-49, and 10% said they had read 50+. The average amount of books read per year for all children age 9-11 was 23. In regards to kids age 12-14, 3% said they had read no books in the past year, 57% said they had read 1-9, 26% said they had read 10-19, 8% said they had read 20-49, and 6% said they had read 50+. The average amount of books read per year for all children age 12-14 was 16. In regards to kids age 15-17, 4% said they had read no books in the past year, 57% said they had read 1-9, 21% said they had read 10-19, 12% said they had read 20-49, and 6% said they had read 50+. The average amoun of books read per year by children age 15-17 was 15. Also taken into consideration was the average number of books read by children provincially. In Ontario, children were shown to read 21 books a year on average. In Quebec, children were shown to read 19 books a year on average. 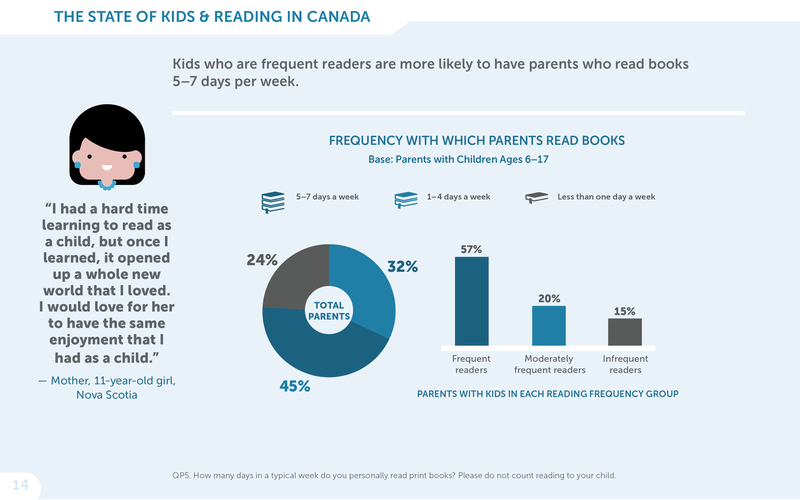 In British Columbia, children were shown to read 25 books a year on average. 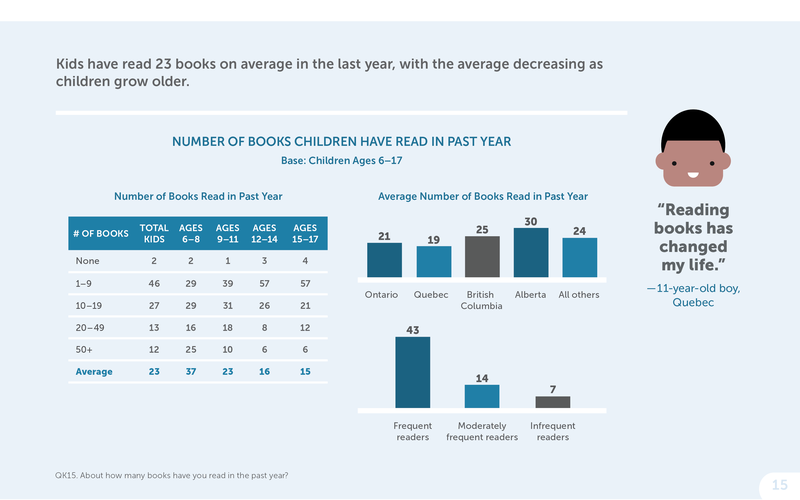 In Alberta, children were shown to read 30 books a year on average. In all other provinces, children were shown to read 24 books a year on average. Kids who identified as frequent readers read 43 books a year on average. Kids who identified as moderately frequent readers read 14 books a year on average. Kids who identified as infrequent readers read 7 books a year on average. An open ended response from an 11 year old boy from Quebec on why he likes reading books for fun: "Reading books has changed my life"
Six in ten kids agree they often choose to read in their free time-this is more common among younger kids, girls, and frequent readers. 62% of children ages 6-17 agree that when they have free time, they often choose to read. Children ages 6-17 were asked how much they agree with the statement "When I have free time, I often choose to read"
40% said that thye agree a lot with the statement, 21% said they agree a little, 26% said they disagree a little, and 13% said they disagree a lot. In total, this showed that 62% of children agreed with the statement to some degree. Looking at kids ages 6-11, 21% agreed a lot, and 47% agreed a little, meaning that a total of 68% agreed with the statement to some degree. Looking at kids ages 12-17, 22% agreed a lot, and 33% agreed a little, meaning that a total of 55% agreed with the statement to some degree. Looking at boys exclusively, 12-17, 15% agreed a lot, and 39% agreed a little, meaning that a total of 54% agreed with the statement to some degree. Looking at girls exclusively, 12-17, 27% agreed a lot, and 41% agreed a little, meaning that a total of 68% agreed with the statement to some degree. Regarding children who identified as frequent readers, 40% agreed a lot, and 40% agreed a little, meaning that a total of 80% agreed with the statement to some degree. Regarding children who identified as moderately frequent readers, 15% agreed a lot, and 48% agreed a little, meaning that a total of 68% agreed with the statement to some degree. Regarding children who identified as infrequent readers, 3% agreed a lot, and 15% agreed a little, meaning that a total of 18% agreed with the statement to some degree. Seven in ten children enjoy reading books for fun, with enjoyment being highest among kids ages 9-11. When a base of children ages 6-17 were asked about the degree to which they thoroughly enjoyed reading books for fun, 30% said that they loved it, and 38% said that they liked it a lot, yielding a total of 68% of kids who claimed to enjoy reading to some degree. 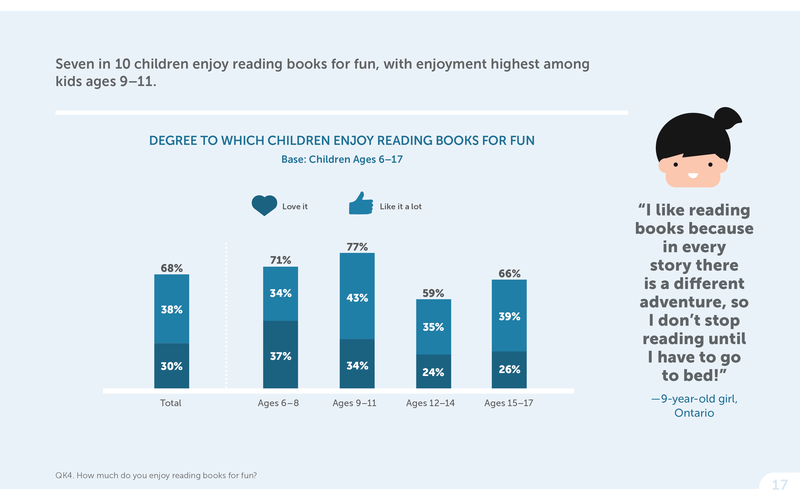 Of children ages 6-8, 37% responded that they loved it, and 34% responded that they liked it a lot, yielding a total of 71% that claimed to enjoy reading to some degree. Of children ages 6-8, 37% responded that they loved it, and 34% responded that they liked it a lot, yielding a total of 71% that claimed to thoroughly enjoy reading to some degree. Of children ages 9-11, 34% responded that they loved it, and 43% responded that they liked it a lot, yielding a total of 77% that claimed to thoroughly enjoy reading to some degree. Of children ages 12-14, 24% responded that they loved it, and 35% responded that they liked it a lot, yielding a total of 59% that claimed to thoroughly enjoy reading to some degree. Of children ages 15-17, 26% responded that they loved it, and 39% responded that they liked it a lot, yielding a total of 66% that claimed to thoroughly enjoy reading to some degree. An open ended response from a 9 year old girl from Ontario on why she enjoy reading books for fun: "I like reading books because in every story there is a different adventure, so I don't stop reading until I have to go to bed!" Kids who enjoy reading most often say it is fun or entertaining and helps them learn new things. Kids who dislike reading most often prefer doing other things. Children from ages 6-17 were asked to elaborate on why they enjoyed, or did not enjoy to read for fun. In total, 76% of kids described why they enjoyed reading for fun, and 24% described why they did not enjoy reading for fun. 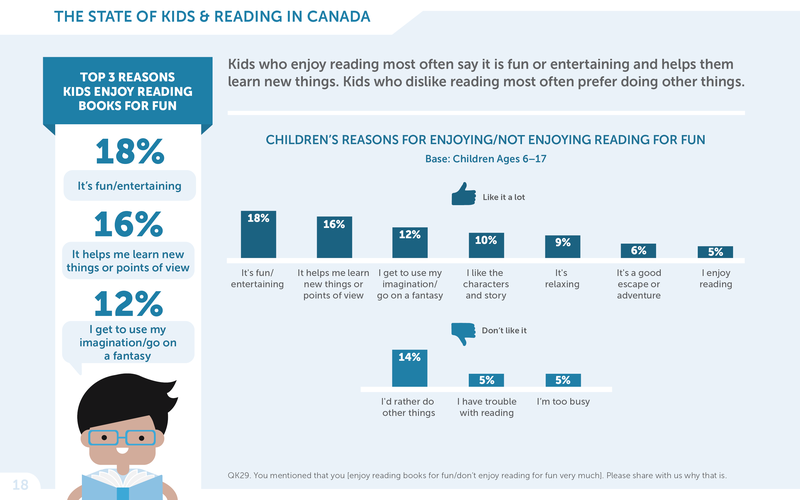 18% of kids said that they enjoy reading because it's fun/entertaining. 16% of kids said that they enjoy reading because it helps them learn new things or points of view. 12% of kids said that they enjoy reading because they get to use their imagination/ go on a fantasy. 10% of kids said that they enjoy reading because they liked the characters and story. 9% of kids said that they enjoy reading because it's relaxing. 6% of kids said that they enjoy reading because it's a good escape or adventure. 5% of kids simply stated that they enjoy reading. 14% of kids said that they do not enjoy reading because they'd rather do other things. 5% of kids said that they do not enjoy reading because they have trouble with reading. 5% of kids said that they do not enjoy reading because they are too busy. Across ages, eight in ten children say they know they should read more books for fun; the same percentage of parents wish their child would read more for fun. 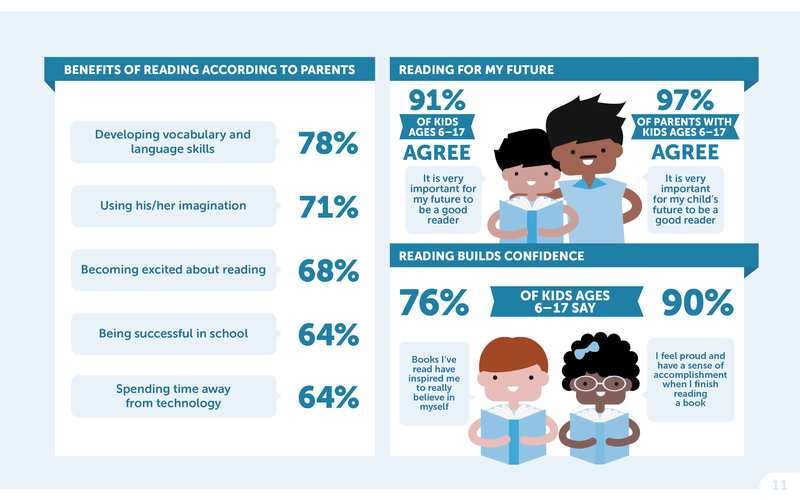 When a base of parents of children ages 6-17 were asked to respond to the statement "I wish my child would read more books", a total of 82% agreed with the statement to some degree. In all, 41% agreed with the statement a lot, 41% agreed with the statement a little, 14% disagreed with the statement a little, and 4% disagreed with the statement a lot. For parents with children ages 6-8, 41% agreed with the statement a lot, and 37% agreed with the statement a little, meaning that 78% of parents agreed with the statement to some degree. For parents with children ages 9-11, 38% agreed with the statement a lot, and 46% agreed with the statement a little, meaning that 84% of parents agreed with the statement to some degree. For parents with children ages 12-14, 44% agreed with the statement a lot, and 39% agreed with the statement a little, meaning that 83% of parents agreed with the statement to some degree. For parents with children ages 15-17, 40% agreed with the statement a lot, and 43% agreed with the statement a little, meaning that 83% of parents agreed with the statement to some degree. 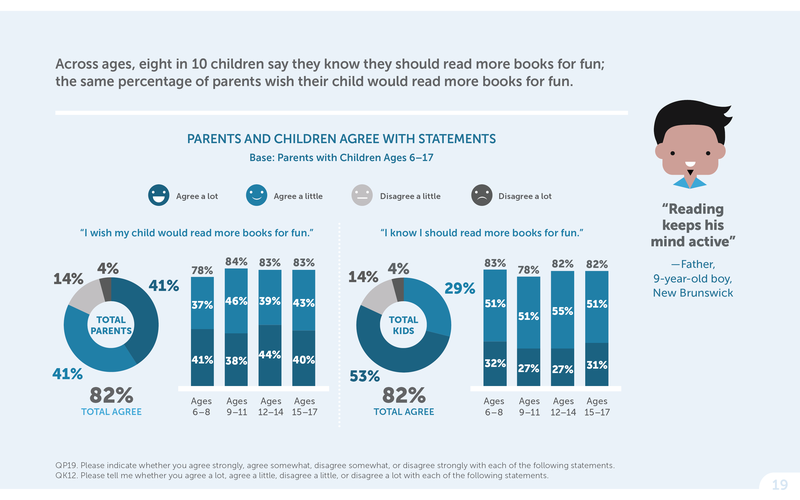 The chidlren themselves were also asked to respond to a similar question: "I know I should read more books for fun", and reflected the same sentiments as their parents,with an identical 82% agreeing with the statement to some degree. In all, 29% of kids agreed with the statement a lot, 53% agreed with the statement a little, 14% disagreed with the statement a little, and 4% disagreed with the statement a lot. For children ages 6-8, 32% agreed with the statement a lot, and 51% agreed with the statement a little, meaning that 83% agreed with the statement to some degree. For children ages 9-11, 27% agreed with the statement a lot, and 51% agreed with the statement a little, meaning that 78% agreed with the statement to some degree. For children ages 12-14, 27% agreed with the statement a lot, and 55% agreed with the statement a little, meaning that 82% agreed with the statement to some degree. For children ages 15-17, 31% agreed with the statement a lot, and 51% agreed with the statement a little, meaning that 82% agreed with the statement to some degree. An open ended response from a Father of a 9 year old boy from New Brunswick on why reading for fun is important "Reading keeps his mind active"
Keeping their child's brain active and enhancing learning is the most frequently mentioned reason parents think reading books for fun is important for their child. Parents of children ages 0-5 who earlier stated their opininion on whether they believed it is important for their child to read for fun were asked why they felt that way. 36% responded that it keeps their chil'd brain active and enhances learning. 22% responded that they want their child to enjoy reading and develop a love for books. 21% responded that they like how reading gets their child to use their imagination. 19% responded that it expands their child's vocabulary and language skills. 12% responded that they believe literacy is an important skill in life. 7% responded that they believe it helps their child to succeed in school. 7% responded that it helps their child to relax. 6% responded that they believe it is a good escape for their child. 6% responded that it reduces the amount of screen time their child receives. An open ended response from a Mother of a 4 year old girl from British Columbia on why reading is important: "Reading will expand her knowledge, help her use her imagination and expand her world. Books are the doorway to a completely different world, and it’s very important that she gets to see that world rather than just watching TV." Older children are more likely to use the internet and technology than read books for fun. A base of children ages 6-17 were asked whether or not they paricipated in various activities for fun on a frequent basis (5-7 days a week). When asked if they frequently read books for fun 50% of kids ages 6-8 said they did, 37% of kids ages 9-11 said they did, 24% of kids ages 12-14 said they did, and 25% of kids ages 15-17 said they did. When asked if they frequently go online for fun, and not for school 27% of kids ages 6-8 said they did, 32% of kids ages 9-11 said they did, 58% of kids ages 12-14 said they did, and 61% of kids ages 15-17 said they did. When asked if they frequently watch videos on youtube for fun, 31% of kids ages 6-8 said they did, 36% of kids ages 9-11 said they did, 54% of kids ages 12-14 said they did, and 53% of kids ages 15-17 said they did. When asked if they frequently play games or apps on any kind of electronic device, 33% of kids ages 6-8 said they did, 41% of kids ages 9-11 said they did, 52% of kids ages 12-14 said they did, and 45% of kids ages 15-17 said they did. When asked if they frequently text message or talk on their mobile device, 13% of kids ages 6-8 said they did, 18% of kids ages 9-11 said they did, 49% of kids ages 12-14 said they did, and 68% of kids ages 15-17 said they did. When asked if they frequently use social media sites and apps, 9% of kids ages 6-8 said they did, 14% of kids ages 9-11 said they did, 43% of kids ages 12-14 said they did, and 66% of kids ages 15-17 said they did. An open ended response from a Mother of a 15 year old girl from Ontarion about the importance of reading for fun: "I just feel these days kids-teens in my case-are too attatched to social media and their phones. Anything that gets them away from that is good, especially reading." 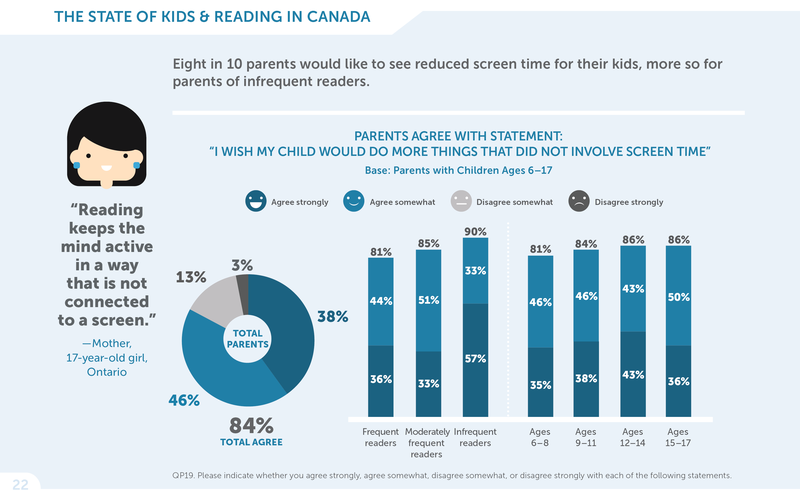 Eight in ten parents would like to see reduced screen time for their kids, more so for parents of infrequent readers. When a base of parents with children ages 6-17 were asked whether or not they agree with the statement " I wish my child would do more things that did not involve screen time", a total of 84% agreed with the sentiment to some degree. In all, 38% of parents agreed strongly with the statement, 46% agreed somewhat, 13% disagreed somewhat, and 3% disagreed strongly. For parents of children considered to be frequent readers, 36% agreed strongly with the statement, and 44% agreed somewhat, ,meaning that a total of 81% agreed with the statement to some degree. For parents of children considered to be moderately frequent readers, 33% agreed strongly with the statement, and 51% agreed somewhat, ,meaning that a total of 85% agreed with the statement to some degree. For parents of children considered to be infrequent readers, 57% agreed strongly with the statement, and 33% agreed somewhat, ,meaning that a total of 90% agreed with the statement to some degree. For parents of children ages 6-8, 35% agreed strongly with the statement, and 45% agreed somewhat, ,meaning that a total of 81% agreed with the statement to some degree. For parents of children ages 9-11, 38% agreed strongly with the statement, and 46% agreed somewhat, ,meaning that a total of 84% agreed with the statement to some degree. For parents of children ages 12-14, 43% agreed strongly with the statement, and 43% agreed somewhat, ,meaning that a total of 86% agreed with the statement to some degree. For parents of children ages 15-17, 36% agreed strongly with the statement, and 50% agreed somewhat, ,meaning that a total of 86% agreed with the statement to some degree. An open ended response from a Mother of a 17 year old girl from Ontario on why reading for fun is important: "Reading keeps the mind active in a way that is not connected to a screen." The majority of kids agree that being a good reader is very important for their future. Virtually all parents believe that being a good reader is important for their child's future. 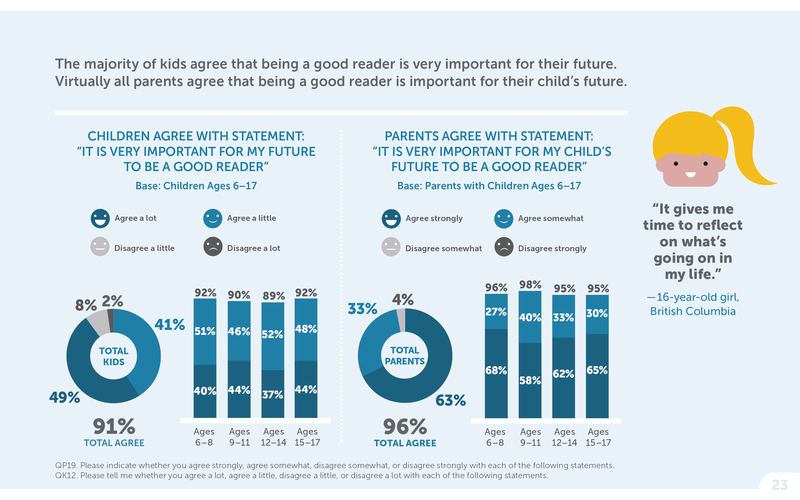 Children from ages 6-17 were asked whether they agreed with the statement that "It is very important for my future to be a good reader", to which 91% agreed in some capacity. In total, 41% of kids agreed a lot that being a good reader would be very important for their future, 49% agreed a little, 8% disagreed a little, and 2% disagreed a lot. For children of ages 6-8, 40% agreed a lot, and 51% agreed a little, meaning that a total of 92% agreed with the statement to some degree. For children of ages 9-11, 44% agreed a lot, and 46% agreed a little, meaning that a total of 90% agreed with the statement to some degree. For children of ages 12-14, 37% agreed a lot, and 52% agreed a little, meaning that a total of 89% agreed with the statement to some degree. For children of ages 15-17, 44% agreed a lot, and 48% agreed a little, meaning that a total of 92% agreed with the statement to some degree. Parents of children ages 6-17 were also asked whether they agreed with the thought that it is very impoprtant for their child to be a good reader for their future, to which 96% agreed in some capacity. In total, 63% of parents agreed strongly, 33% somewhat agreed, and 4% somewhat disagreed to this sentiment. Parent of children of ages 6-8 agreed strongly 68% of the time, and somewhat agreed 27% of the time, meaning 96% agreed in some capacity. Parent of children of ages 9-11 agreed strongly 58% of the time, and somewhat agreed 40% of the time, meaning 98% agreed in some capacity. Parent of children of ages 12-14 agreed strongly 62% of the time, and somewhat agreed 33% of the time, meaning 95% agreed in some capacity. Parent of children of ages 15-17 agreed strongly 65% of the time, and somewhat agreed 30% of the time, meaning 95% agreed in some capacity. An open ended response from a 16 year old girl from British Columbia about the importance of reading books for fun: "It gives me time to reflect on what's going on in my life"
Among parents, developing vocabulary and language skills and using imagination are the most sought-after benefits of reading. Parents of children ages 0-17 were asked which benefits they most wanted their children to gain from reading books for fun. 78% of parents expressed that they wanted reading to benefit their child in developing vocabulary and language skills. 71% of parents expressed that they wanted reading to encourage their children to use their imagination. 68% of parents expressed that they wanted their children to become more excited about reading. 64% of parents expressed that they wanted reading to help their children to be successful in school. 64% of parents expressed that they wanted reading to help their children spend more time away from technology. 58% of parents expressed that they wanted reading to give their child more time to relax. 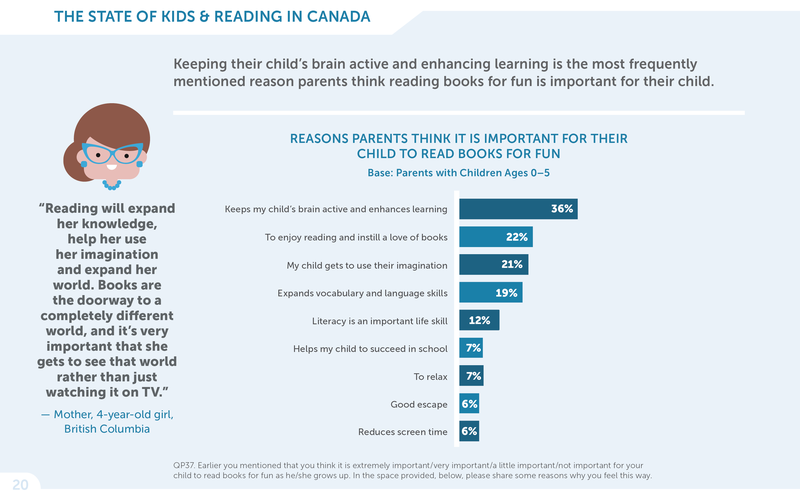 52% of parents expressed that they wanted reading to help their child discover new things they might not experience first-hand. 49% of parents expressed that they wanted reading to allow their children to learn from inspiring characters. 47% of parents expressed that they wanted reading to teach their children ways to deal with what they are going through. 39% of parents expressed that they wanted reading to help their children to forget about real life for a while. An open ended response from a Mother of a 3 year old boy from Alberta about the benefits of reading books for fun: "I feel that a joy of reading will help him go far in life, educationally. It will help him learn about different experiences,, places, people and times in the world." Children, particularly those who are frequent readers, gain inspiration and a sense of accomplishment from reading. When asked whether or not they agree with the statement: "Books I've read have inspired me to really believe in myself", 76% of children ages 6-17 agreed with the statement to some degree. Of all children asked, 25% agreed strongly with the statement, 51% agreed a little, 20% disagreed a little, and 4% disagreed a lot. Of children who identify as frequent readers asked, 38% agreed strongly with the statement, and 48% agreed a little, meaning a total of 86% agreed with the statement to some degree. Of children who identify as moderately frequent readers asked, 22% agreed strongly with the statement, and 58% agreed a little, meaning a total of 80% agreed with the statement to some degree. Of children who identify as infrequent readers asked, 7% agreed strongly with the statement, and 36% agreed a little, meaning a total of 43% agreed with the statement to some degree. Kids of ages 6-17 were also asked to state how much they agreed or disagreed with the statement: "I feel proud and have a sense of accomplishment when I finish reading a book", to which 90% agreed with the statement in some capacity. In total, 40% of children asked agreed with this statement a lot, 50% agreed a little, 8% disagreed a little, and 2% disagreed a lot. Of children who identify as frequent readers asked, 52% agreed strongly with the statement, and 42% agreed a little, meaning a total of 94% agreed with the statement to some degree. Of children who identify as moderately frequent readers asked, 39% agreed strongly with the statement, and 52% agreed a little, meaning a total of 91% agreed with the statement to some degree. Of children who identify as infrequent readers asked, 18% agreed strongly with the statement, and 61% agreed a little, meaning a total of 79% agreed with the statement to some degree. An open ended response from a 13 year old girl from Ontario about the benefits of reading books for fun: "Some characters in the stories have inspired me to become a better person"